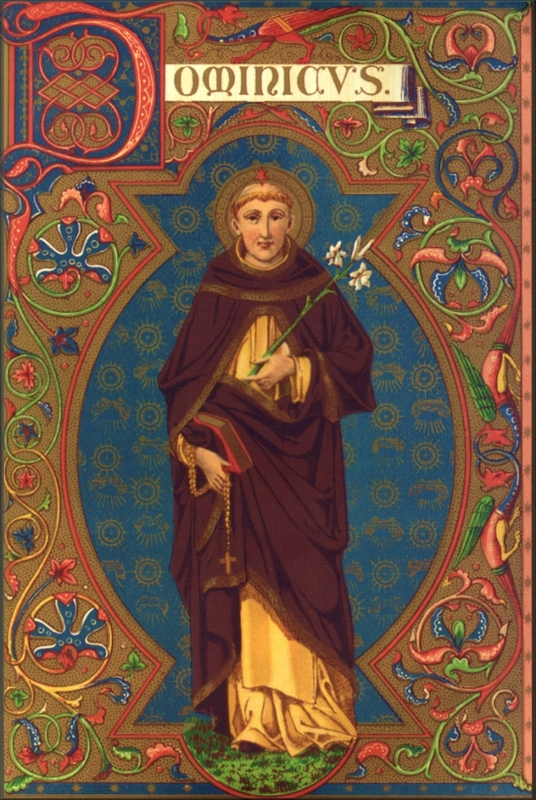 Inspired by the Holy Ghost, instructed by the Blessed Virgin as well as by his own experience, Saint Dominic preached the Holy Rosary for the rest of his life. He preached it by his example as well as by his sermons, in cities and in country places, to people of high station and low, before scholars and the uneducated, to Catholics and to heretics. "Dominic, even though what you have planned to say may be very good, I am bringing you a much better sermon." So he began preaching the Holy Rosary and explained the Hail Mary word by word as he would to a group of children and used the very simple illustrations which were in the book Our Lady had given him.
" 'My Lords and illustrious Doctors of the University, you are accustomed to hearing learned sermons suited to your aesthetic tastes. Now I do not want to speak to you in the scholarly language of human wisdom but, on the contrary, to show you the Spirit of God and His Greatness.' "
"This is why, before doing anything else, priests should try to kindle a love of prayer in people's hearts and especially a love of my Angelic Psalter. If only they would all start saying it and would really persevere, God, in His mercy, could hardly refuse to give them His grace. So I want you to preach my Rosary.' "
In another place Blessed Alan says: "All priests say a Hail Mary with the faithful before preaching, to ask for God's grace. They do this because of a revelation that Saint Dominic had from Our Lady. 'My son,' she said one day 'do not be surprised that your sermons fail to bear the results you had hoped for. You are trying to cultivate a piece of ground which has not had any rain. Now when Almighty God planned to renew the face of the earth He started by sending down rain from Heaven----and this was the Angelic Salutation. In this way God made over the world. This last quotation is from the Book of Miracles of the Holy Rosary (written in Italian) and it is also to be found in Justin's works (143d Sermon). As long as priests followed Saint Dominic's example and preached devotion to the Holy Rosary, piety and fervor thrived throughout the Christian world and in those religious orders which were devoted to the Rosary. But since people have neglected this gift from Heaven, all kinds of sin and disorder have spread far and wide. 1. We have omitted the Latin quotations so as to not encumber the text. English translations have been given above.